Food Friday: Pilipit ~ I Can Do That! 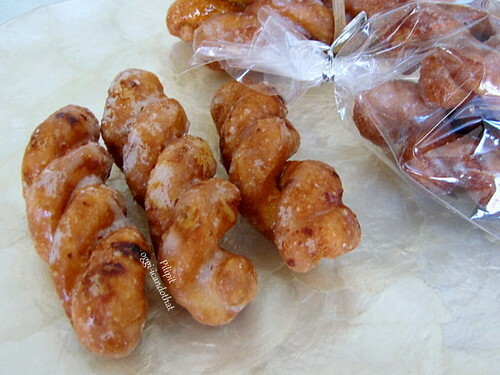 Pilipit, Tagalog word for twisted or twist, are hard crunchy sugar-glazed bread twists...one of my favorite snacks back in the Philippines. I have been waiting for them for months now to become available at the Philippine grocer. I made some because I couldn't wait any longer and I really have the munchies for them. It's not complicated to make but isn't easy as pie either. Pilipit: In a medium bowl, mix all the ingredients except oil and knead on the kitchen counter until smooth. Cover with plastic wrap and let rest for 15 minutes. Divide into 2 equal portions, wrap one half in plastic and set aside. Roll the other half into 1 inch thick log and cut into 1 ½ inch-long pieces. Roll each piece into a pencil-thin rope. Roll both ends in opposite directions which will twist the rope. Bring the ends together, pinch, and twist. Lay each twist on a flat surface, cover loosely with plastic wrap and let rest for 15 minutes. Repeat with the other half of the dough. Heat the oil to 375°F and fry the pilipit until golden brown. Drain on colander lined with paper towels. Let cool completely on wire rack/s. Glaze: Heat the sugar and water in a small saucepan and cook over medium heat until sugar has melted. Let simmer for 2 minutes. Remove from heat and dip the cooled twists one at a time. Let dry on a wire rack, turning them so that both sides dry completely. Store the Twists: Keep the glazed twists in a jar and leave for a few days until they become hard and crunchy. I had an attack of nostalgia when I saw your pilipit bundle. They look awfully familiar and rustic. You did a good job replicating these childhood favorites. Oggi those are so pretty, they look like breakfast! i really like this snack too. i remember breaking my braces on them even though i wasn't supposed to eat them. I remember these as a lunch-box regular when I was in grade school. So crunchy and sweet! I have been craving those. I have yet to try to make them. 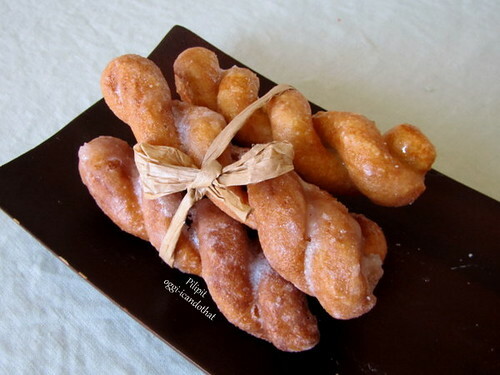 These are the same as those french crullers, right?